Kolin draws his inspiration from this spiritual friend whom he knew for over 40 years. Midge was a Benedictine Oblate who cultivated the life within, her ‘inner’ monk. (Oblates can be either laypersons or clergy, and are affiliated with a monastic community, comparable to the tertiaries associated with other orders.) She lived her life of love for God in the world of family and society. begging for her rich mites. She was a spiritual guide to many, in the spirit of St. Benedict’s Holy Rule. Kolin gives poetic expression to this life lived in God’s service, a life that embraced the spirituality and liturgical life of monasticism. the caress of cowls and veils. 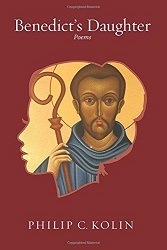 Side by side with poems of her life, are others that reflect Benedictine traditions, such as: praying the Liturgy of the Hours, vows of stability (taken by the oblates), hospitality, and silence. This collection includes a variety of poetic forms, styles, and devices. These poems are set in the Delta; a region in northern Mississippi that lies between the Yazoo and Mississippi rivers and is known for its cotton and for blues music, and where poverty and economic mobility are worse than anywhere else in the developed world. All ring souls with delight. God fills daybreak with himself. Kolin’s accomplishments as a poet and an editor mark him as one of Mississippi’s important creative writers. He is the Distinguished Professor of English (Emeritus) at the University of Southern Mississippi where he also edits the Southern Quarterly. He has written or edited 40 books, including seven collections of poetry, the most recent being Emmett Till in Different States: Poems.